Former England captain Michael Vaughan hailed Ben Stokes after the all-rounder hit the fastest Test century at Lord's. Stokes reached his second Test hundred from just 85 balls, hitting 15 fours and three sixes in his 101 on day four of the first Test against New Zealand. "I can't tell you how good an innings that was," Vaughan told BBC Test Match Special. "To look so much in control was extraordinary. 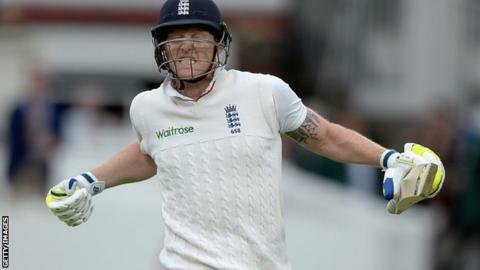 "The cricket over four days has been fantastic but Stokes surpassed it." England have been criticised for a lack of flair in recent times, but after skipper Alastair Cook and Joe Root shared 158 for the fourth wicket, Stokes made 101 of a 132-run partnership with his captain. "That's the way to reconnect with the cricketing public," Vaughan said. "They were dancing in the stands. "The whole game has been tremendous for Test cricket. It shows if you have a mindset of attack you can put quality teams like New Zealand under pressure." Vaughan compared Stokes to legendary Australia wicketkeeper-batsman Adam Gilchrist, who hit 5,500 Test runs at an average of 47.60, including a hundred from 57 balls against England in 2006, the fastest in Ashes history. "Gilchrist used to do that all the time for Australia with his team in trouble, smash it around for a couple of hours and put them on top. Ben Stokes has just done that for England." "Stokes didn't do anything daft - when the ball was up he hit it. He expressed himself. When you can bat and bowl, a la Ian Botham, it frees up your mind as an all-rounder. You're not totally dependent on one skill." There was also praise for stand-in coach Paul Farbrace, who promoted Stokes in the batting order in his first match at the helm for England. "Paul Farbrace was the guy that moved Stokes to number six. He deserves a huge amount of credit. He has given him responsibility and told him to go out and play his natural game," Vaughan said. New Zealand batsman Ross Taylor said: "The way Cook and Stokes batted took the game away from us. We have to wait and see what happens tomorrow. We have to try to get those four wickets. "He lived in New Zealand for 10 years, didn't he? I did ask him if his mum and dad would be watching. Not only today, but in the first innings he came out and played his shots. "He wasn't reckless, it was controlled. I probably shouldn't say this, but it was very good to watch. The crowd got behind him. He's very talented and he showed the type of player he will be for England in years to come."